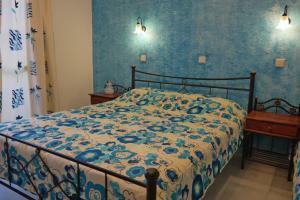 The place is well located and good value for money. The swimming pool is very nice and clean. The views from the room are lovely, we had two balconies for ourselves, the studio was clean and everyday we got fresh towels. The beach is only a few steps away and it is a gorgeous beach. There’s a lot of shops and restaurants and all you could possibly need on your doorstep including pharmacy, car rentals, bakery and mini super markets. It’s a very quiet place perfect for a good night’s sleep. Location. 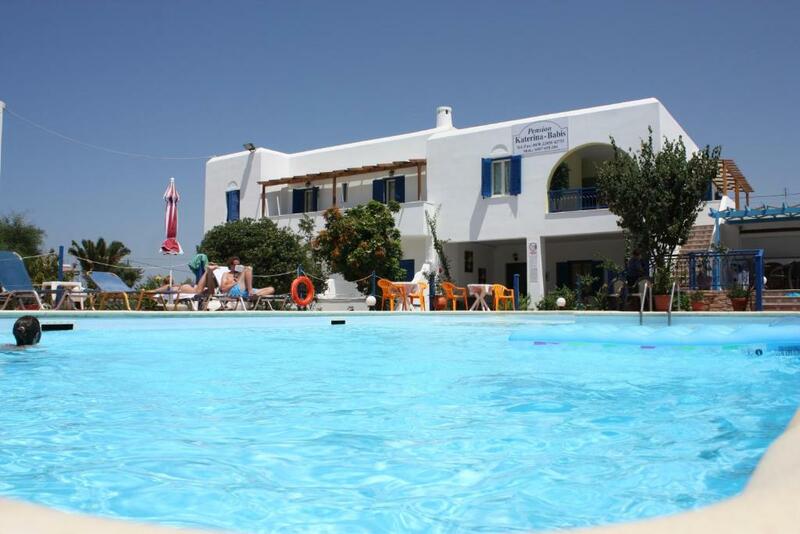 Very close to Agios Prokopios beach and restaurants, which is beautiful. Nice balcony area. The bathroom. Very nice and modern. Great shower. 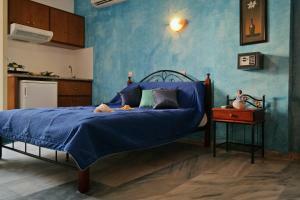 Comfortable beds which is not common in Greece! Very close to restaurants, super markets and the beach. Great location. 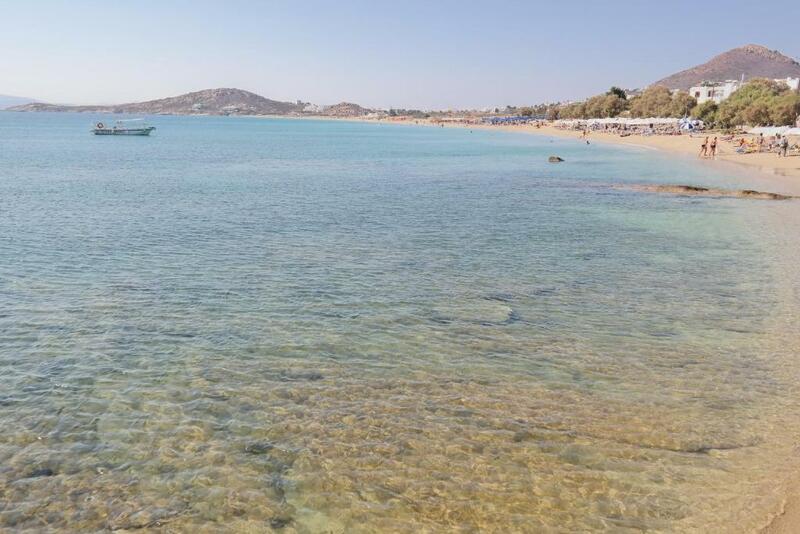 Quiet but few metres from great beach and sparkling blue sea, great tavernas and bars, supermarket, ATM machines, pharmacy, bakeries and cafes, bus stop to town and other beaches. 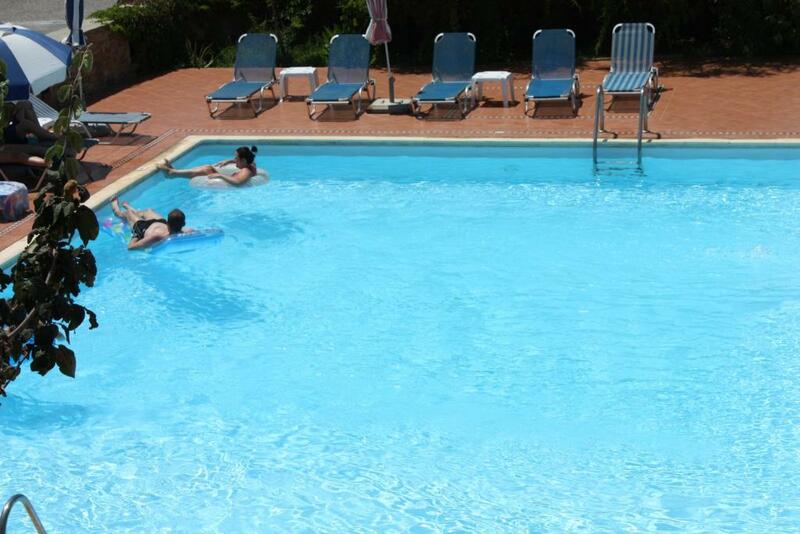 Clean pool with lots of sunbeds and not too busy. Clean rooms and fresh towels. Fantastic value for money. 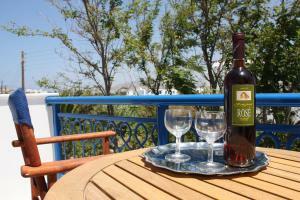 Nice location, near port and bus stop and lots of restaurants, beaches, shops. Friendly staff. Nice swimming pool with sunbeds. The location was great for proximity to Agios Prokopios beach (a very short walk, though you need to watch out for the cars as there is no formal sidewalk and the road is very narrow in parts) the bus stop to connect to the rest of the island (by the taxi stand where the main road curves at the beach, you can buy bus tickets at the grocery store that is a short walk away from the beach from Katerina Babis) and to the shops and restaurants of the main road through the town. Our kids loved the pool which was clean, had a sectioned off shallow end and many inflatables to float on/toss around. We liked our small patio and the clothes drying rack on it was useful. Accommodation in the city near all bars and restaurants, market a few steps away, clean rooms, very nice and large swimming pool,..
Beautiful pool great location in town and 2 min walk to fantastic beach. Great rates too! Lock in a great price for Katerina Babis Studios – rated 8.1 by recent guests! Katerina Babis Studios is located just steps away from the sandy beach of Agios Prokopios. It features an outdoor pool surrounded by sunbeds. Air-conditioned accommodations features a terrace or balcony. 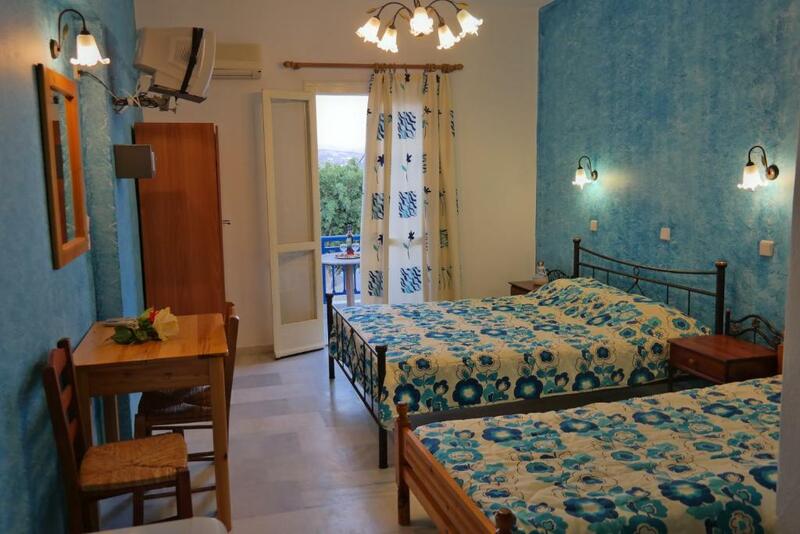 Each of the studios and apartments offers offers free Wi-Fi and a kitchenette with a fridge and cooking hobs for the preparation of light meals. They include a TV, iron and private bathroom with shower. Restaurants, café-bars and shops are within a short walking distance from Katerina Babis Studios. 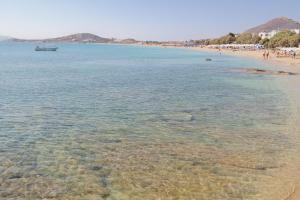 It is 3.7 mi from Naxos Town. Free private parking is possible on site. When would you like to stay at Katerina Babis Studios? Featuring a terrace or balcony, this studio is air conditioned and offers free Wi-Fi and a kitchenette with fridge and cooking hobs. Includes an iron, TV and private bathroom. Featuring a terrace or balcony, this apartment is air conditioned and offers free Wi-Fi and a kitchenette with fridge and cooking hobs. Includes an iron, TV and private bathroom. House Rules Katerina Babis Studios takes special requests – add in the next step! Katerina Babis Studios accepts these cards and reserves the right to temporarily hold an amount prior to arrival. It’s very hard to find the reception open or any staff member around. They leave a piece of papper on the reception’s door with a phone number in case you need to talk to someone. Room smelled of mould. Bathroom was awful and smelly too. I think that’s where the mouldy smell came from. Staff were not overly friendly. Water sometimes didn’t even turn on. Other times it was either trickling or shooting out. The spout of the sink broke while we were there too. Water gets all over the floor when showering because the curtains don’t go all the way down. The staff seems completely uninterested in their jobs. WiFi almost never worked well. Horrible value for the money. The doors are very thin so you could hear everything in the hallways. Got woken up in the night as a result. Wouldn’t recommend. The location = very close to the beach. The view from the balcony was not so good, we saw an other hotel and its swimming pool. Nice balcony, good sized pool, close to beach. Rather old fashioned and tired décor but not surprising for price. Don't be put off because all is adequate and the staff are very accommodating. Very simple kitchen, but just like most apartments in Greece. Our room was small and spartan. The towels were rather rough and the beds weren't very comfortable. I am not complaining as overall it was good value compared to the other hotels we considered for our week on Naxos but if you think you will spend a lot of time in your room you may be better somewhere else. Bring your own shampoo and soap, as none is provided for the bathroom though dish soap was by the sink in the kitchenette area. At night there were usually a few mosquitoes buzzing around but once we hunted them down, closed the bathroom door (there was an open area in the upper bathroom wall that I think allowed access from outside for bugs) and turned on the air conditioning it was fine. Customer service was terrible, we were there 4 nights. When we checked in they didn't told anything or ask do we want to know something about area. During our stay there they didn't say even "hi". Our first room was terrible, there was hole in the bathroom's roof. Our door's lock doesn't work and when i said to them, they just came look it and go away. They didn't say anything to me. That time our door was open and i have to go ask what happen know, the girll who works there told me that they have to buy new lock first. I said i want to change room cause i dont have time to wait. We got new room and it was little bit better. I told to girl that i want some discount cause the first room was terrible, wifi doesn't work there also. Girl say yes but when we checked out i have to pay hole price, cause i made the reservation threw booking.com That isn't true! I am also receptionist and i know that it possible. This was the worst hotel where i never been. Good location and nice pool area.